The first brewery in Italy was founded in 1845 in Turin. Unfortunately, after more than 100 years of producing beer in Italy, micro and mini breweries disappeared during the economic boom during the 1960s. For the next 50 years, beer consumed in Italy was either imported or produced on an industrial scale in Italy. The first microbreweries started reappearing in 1997. A modest number of 30 existed 10 years ago, while now there are about 300. In general, the Italians know all about wine, while they know next to nothing about beer. By happy chance, the sense of taste is changing. Formerly, beer in Italy was drunk with pizza only, while now you can find beers suitable for drinking with fresh and mature cheeses, starters, fish, desserts, etc. In fact, there is a beer for every course. Even restaurants are starting to offer a varied selection of beers. 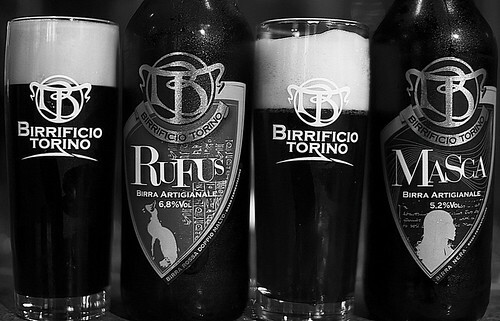 Turin Brewery or “Birrificio Torino” in Italian is located near Mole Antonelliana, the major landmark of Turin. Being originally a candy factory, the present owners, Mauro Mascarello and Claudia Fertino, have turned it into a combined brewery and restaurant. When this combined restaurant and brewery was opened, the owners didn’t make any publicity at all, just being a pub and brewery quite out of the ordinary and using word of mouth among beer lovers, was enough to fill up the premises from day one on. Mauro, went to Bavaria, the Czech Republic, Belgium and northern France, in order to learn how to make beer from local master brewers. From each and every one he received advice and experience which he brought back to Turin, in turn making excellent beer for his customers. In order to make prime beers, Mauro has first to select the best ingredients. First, using Turinese water having a medium hardness and being well adapted to making beer, Then, depending on which type of beer he wants to make, for instance, light or dark, he selects a certain kind of malt, while depending on the amount of bitterness he wants to obtain, he can select from various types of hops. Finally, in order to turn sugar into alcohol, he also has to add yeast. Beers, being live products, are neither pasteurized nor filtered at this brewery, making them keep their flavours and tastes like a fresh product for a limited time. In addition, no artificial preservatives are added and the only method of conservation is done by cooling the beers. Cooling the beers excessively will change their tastes, meaning that every beer should be stored and served within a specific temperature range in order to enjoy the individual characteristics of each beer together with an accompanying meal served at the restaurant of Birrificio Torino.